I kicked off the year with a bang, going to see the Vaccines play a headlining show at the Paradise Rock Club in Boston. The Paradise Rock Club is one of my favorite Boston venues, because its just small enough that there’s really no bad spot in the house. The openers for the show were a (relatively) unknown band from Australia named San Cisco. I looked up their music ahead of time and was impressed by their catchy first single, Awkward. San Cisco is group of young kids, just barely out of high school, but they put on a great live set. I was an instant fan after seeing them live. The Vaccines put on a tremendous set as well. Some might criticize Justin’s vocal performance, which was less than perfect, but he puts so much energy into his live sets its hard to not be won over by his passion and enthusiasm. Next I got the chance to see English folk artist Benjamin Francis Leftwich play a set for Radio BDC at Naga in Boston. The venue was beautiful, with hanging glass above the bar; but the crowd was less than respectful during the show. Leftwich is a very mellow artist, its just him and his acoustic guitar, and there was a group of obnoxious people over at the bar who were disrespectfully loud throughout his set. He made sure to call them out on it though, causing the rest of us to laugh. I got the chance to meet him after and he truly is a sweet guy. Not long after I saw San Cisco open for the Vaccines I was thrilled to hear that the band was coming back through Boston for their first US Headlining Tour. They played Great Scott in Alston, another one of my favorite venues. The support bands were great, and I discovered a great local artist (Steph Barrack) when she opened for the band. My fellow concert goer was more impressed by Chaos Chaos, who won me over with their live vocals but also for having a oboe in their backing band. 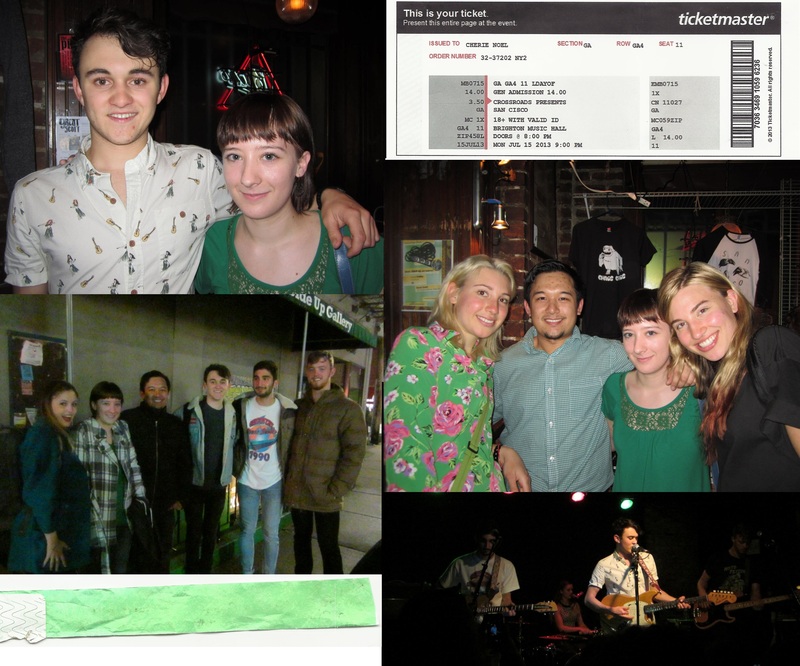 San Cisco put on a great live set, and we even got to meet the band afterward. 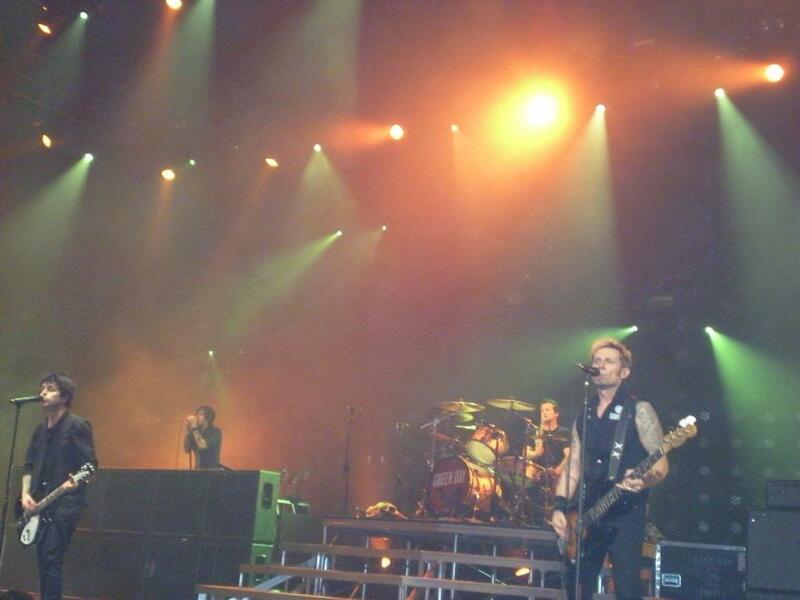 The band swung back through one more time in July, and we were there front and center once more. Mark my words, they really are a fantastic band and they have such a bright future ahead of them. It will be fun watching them grow over the years. 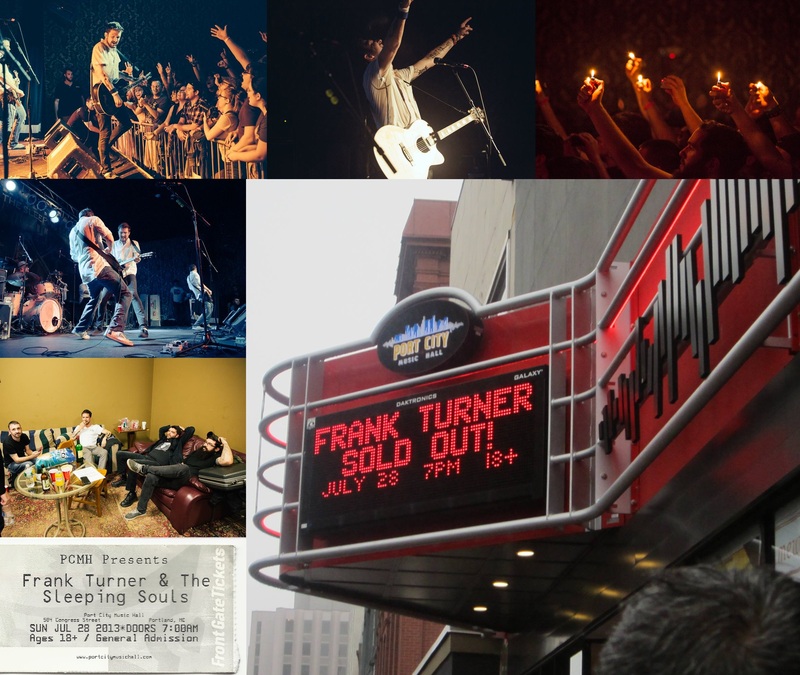 It was a long, hot July, but the hottest day by far was the day I saw Frank Turner in Portland, Maine. There’s no reason the show should have been as hot as it was, the day was actually cool and rainy but for some reason the temperature inside the venue was off the charts. 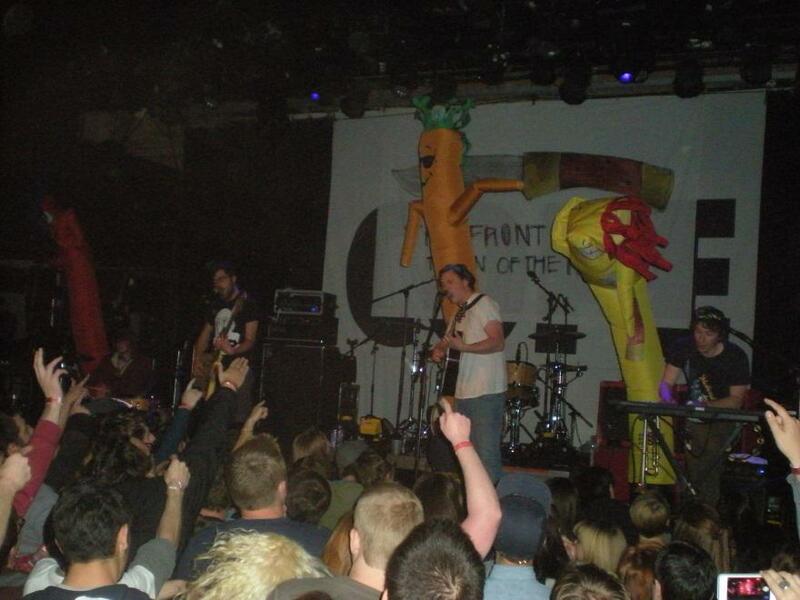 After just a couple of songs Frank was drenched in sweat and joked about it being the hottest show he’d ever done. It was an amazing experience getting to see Frank perform songs off of Tape Deck Heart which is one of my favorite albums of 2013. 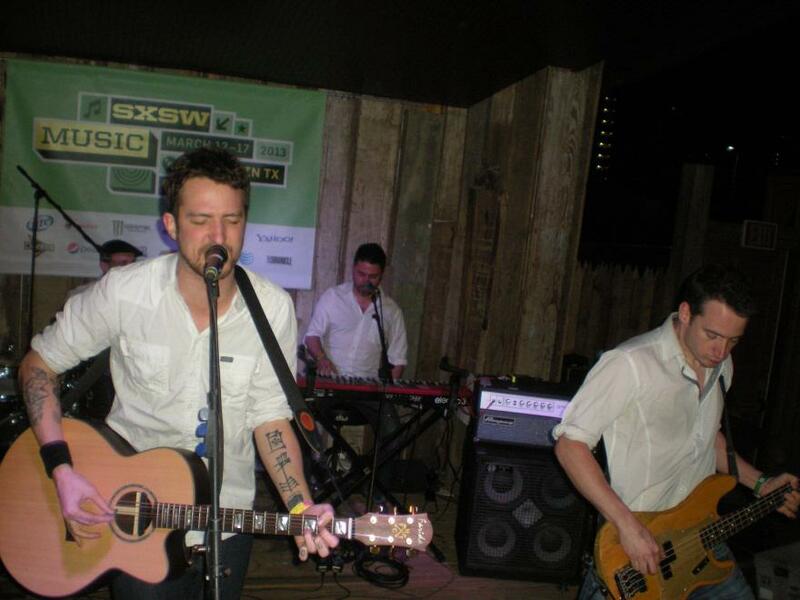 I also got the chance to see the amazing Ben Marwoos, sorry Ben Marwood, open for Frank Turner; which ended up being a more momentous experience then I realized at the time. After every show I go to I try to find the setlist and burn a copy of the setlist onto a CD. I make personalized art work and everything (though its really nothing that special to be honest). When I realized that I probably wasn’t going to find Ben’s setlist on setlist.fm (my usual source for the information), I felt like I was facing a brick wall. On a whim I reached out to Ben via e-mail, not expecting to ever hear back from him. To my surprise he responded almost instantly, revealing that he actually keeps a notebook full of setlists and promptly sent me the information I had asked for. Realizing what a great opportunity I had I immediately thanked him and asked him if he’d be willing to do a short interview for my music blog and he instantly agreed (you can read the article here and the full interview here). It was the first “big scoop” for the blog, and I will always be proud that my first interview was with Ben (seriously, he’s such a talented guy, you should check out his music if you haven’t yet). August brought one of the biggest concerts of the year. 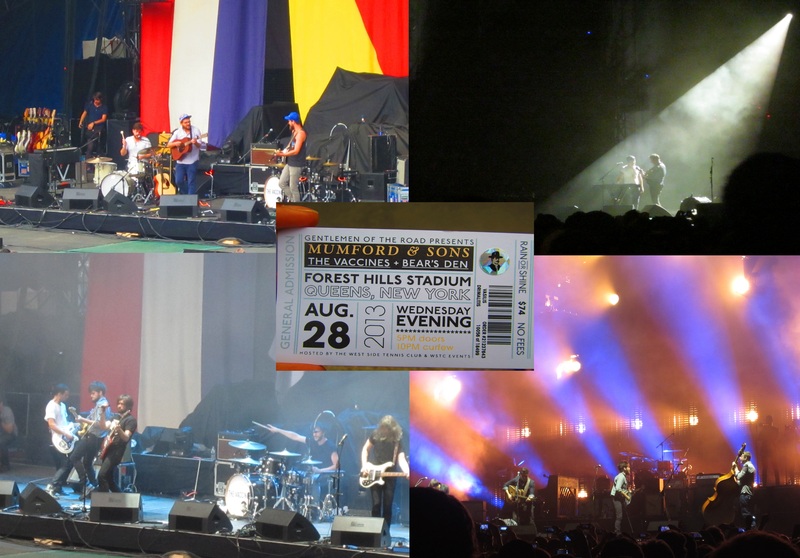 Mumford and Sons had announced a show in Queens, NY and with the help and company of some good friends, I had the chance to go. It was an unbelievable experience. The crowd might have sucked, but the company I was in certainly didn’t. 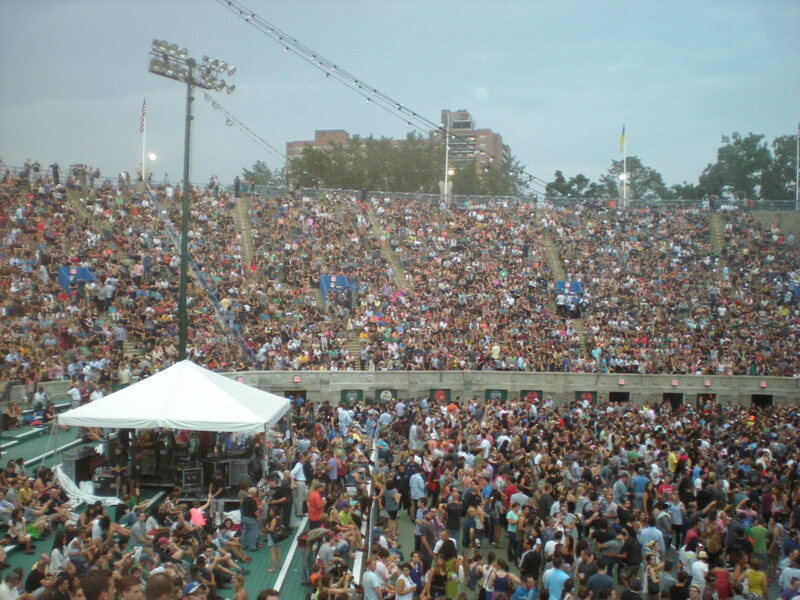 Forest Hills Stadium was an incredible venue, being a converted tennis stadium, and despite the hiccups I hope they finish the restoration project and restore it to a concert venue in the future. I fell in love with the opening band, Bear’s Den, who put on an amazing set despite only having three members. The Vaccines came next, and the highlight from their set was when Winston Marshall, from Mumford and Sons, came out to play guitar on a couple of songs. 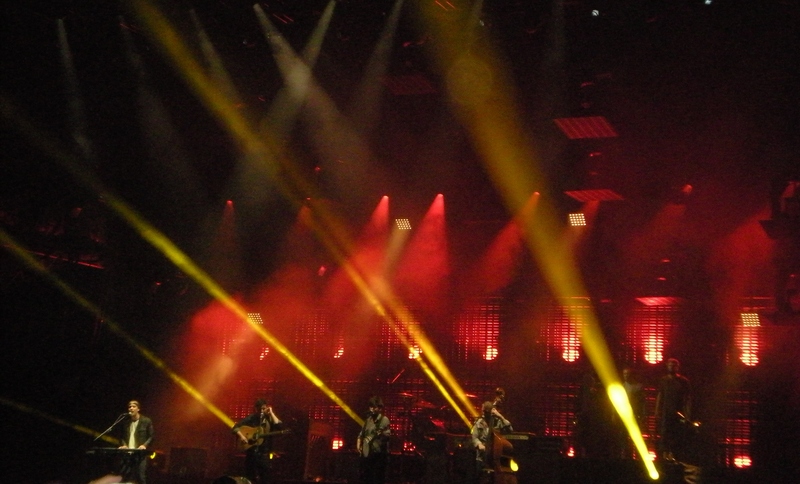 Mumford and Sons themselves were, of course, amazing. Words can’t express my love for this band. They are such a great band, and their songs have helped me through some really hard times. Their Gentlemen of the Road Stopover shows are such an amazing experience; I’m glad I got to experience not just one but two of them. When news broke a few weeks later of their temporary hiatus I was sad, but happy I got to see them twice before they went on break. Rumor has it the boys will be back in the studio in February working on the new album. Here’s hoping that it doesn’t take them as long to write album #3 as it did to write their second album! 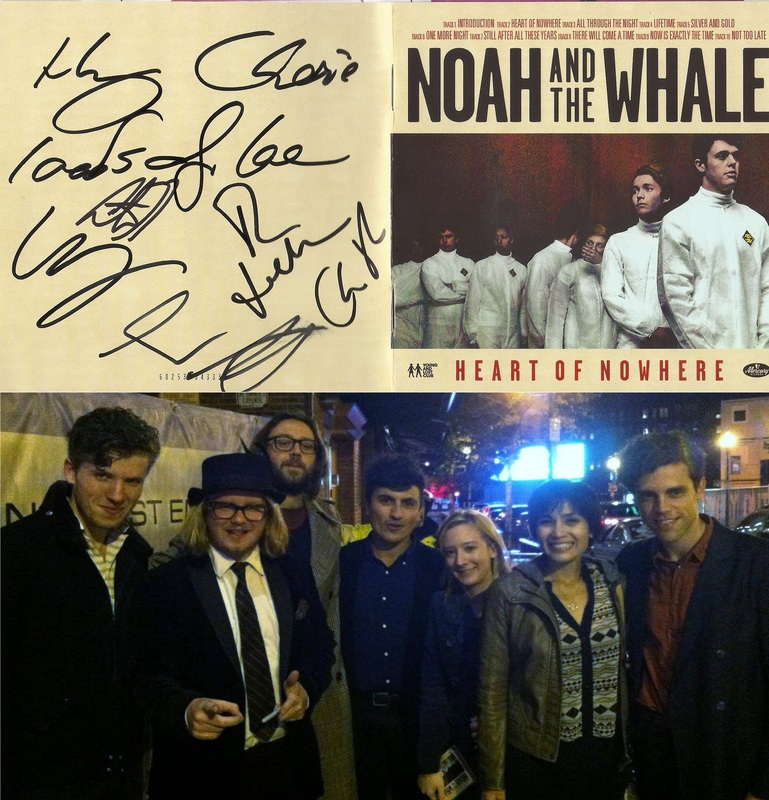 My last concert of 2013 was Noah and the Whale, and what a fitting way to close out the year. 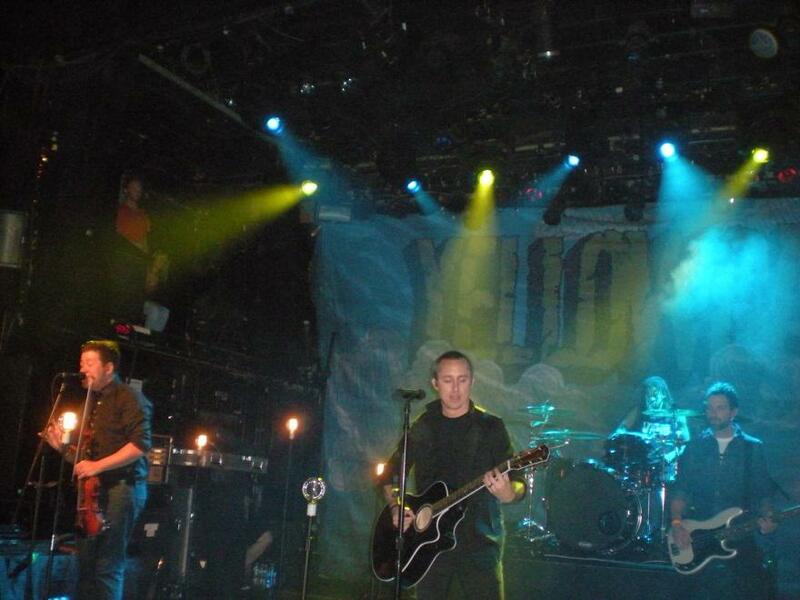 This was my second time seeing the band, but this year they were playing the House of Blues; a step up from their last show at the Paradise Rock Club. They blew me away once more. 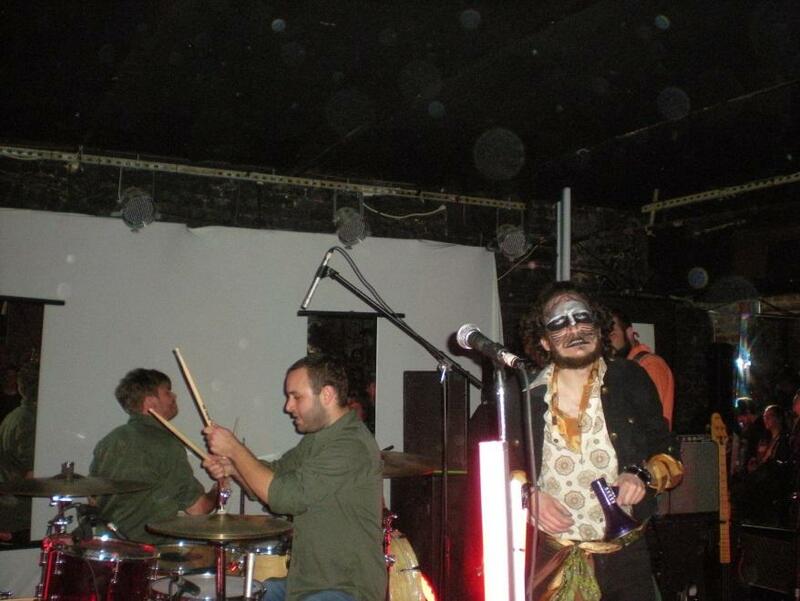 NATW are one of those bands that are made to perform live. Not only did they sound fantastic, but they also dug deep and played songs off their debut album that don’t get played much more. A highlight for me had to be hearing “Mary” played live. After the show we stuck around for a little bit hoping to meet the band. We picked a time to hang out until and decided that if they didn’t come out by that point we would give up. It was cold and windy and with our light jackets we were soon freezing. The time came and passed and no band. I didn’t mention the time to my friend, hoping she wouldn’t realize it and we could stick around a little bit longer. Eventually our patience paid off and the band exited the venue. They seemed surprised to see so many people waiting for them, perhaps because of the weather, but they cheerfully stuck around for pictures. They were the band that really introduced me to British indie folk music, and getting the chance to meet them was truly awesome. But the biggest highlight of 2013 for me had to be Lyrically Addicted. For years I’d had the idea to start some sort of music project, though the specifics were always vague in my mind as to what exactly that project would entail. In May I finally solidified the idea, creating Lyrically Addicted as a sort of music blog, and inviting two of my closest friends to take part with me. It’s been difficult at times, trying to come up with new ideas for stories and debating the relative merits of various albums that were released this year. The whole thing has been a blast so far, and if you’re reading this right now, thank you so much. Your support (even if it’s just silent support) means a lot to me and the rest of the team. I’m proud to announce that by the end of 2013 we reached 2,023 views! I was born and raised in Queens, New York and have lived here my entire life. I went to elementary school and high school within a 10-minute walk from my house. Despite my many criticisms of Queens, I still love this place and can see myself living here my entire life. My favorite baseball team plays here, my favorite places to eat are here, my girlfriend lives here, and it’s also conveniently located near buses and subways that help me get to New York City whenever I want. The only thing I’ve always longed to see in Queens is live music. Citi Field holds almost no live concerts, and all my favorite places, including Irving Plaza, Webster Hall, Music Hall of Williamsburg and The Gramercy Theater are over an hour away in the heart of New York City. So when I heard Mumford & Sons would be playing a show 15 minutes away from my house in Forest Hills, Queens I was ecstatic. 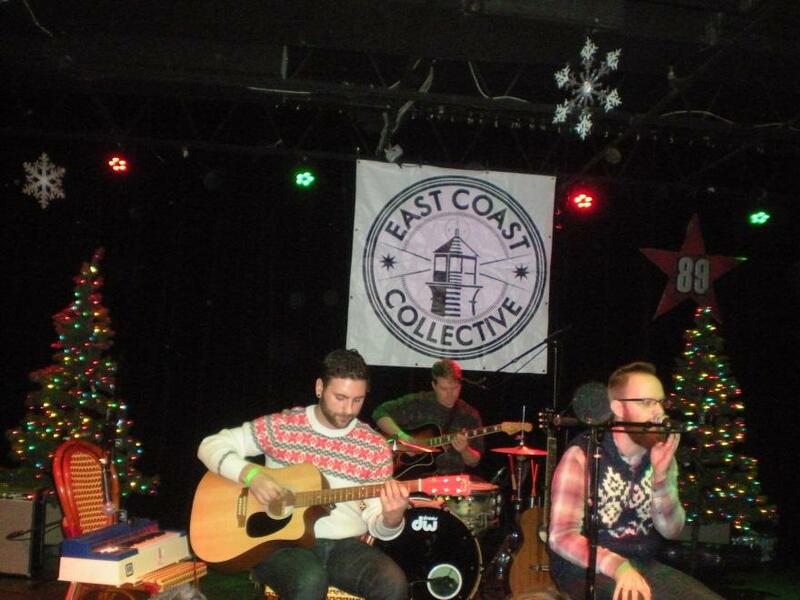 Live music returning to Queens has been a long time coming. I have always half-joked about building my own mid-sized music venue (1000-3000 capacity) in Queens and having all my favorite bands play there, so to actually have a concert in my home borough was a dream come true. 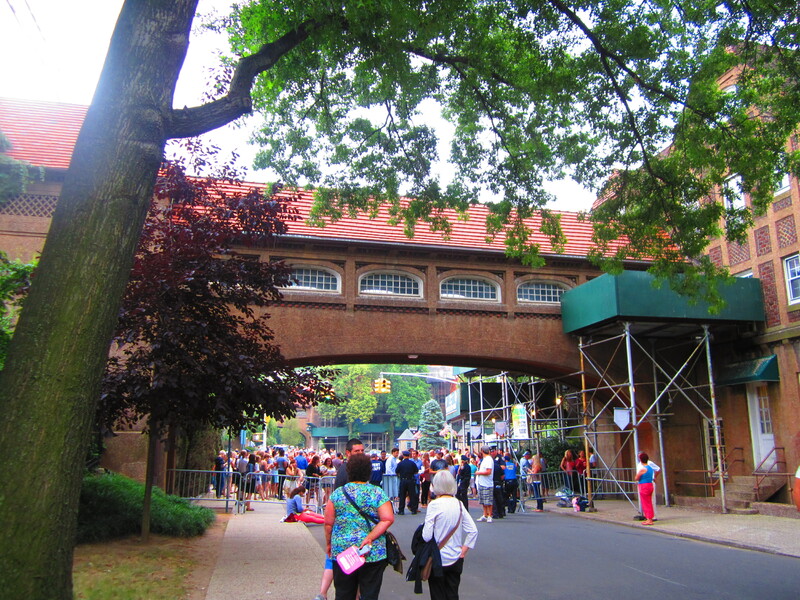 Forest Hills Tennis Stadium, which hosted the U.S. Open before Arthur Ashe Stadium existed, is a little less modest, holding over 16,000 people, but it’s still live music nonetheless, and to actually see a band I like perform there only made it better. 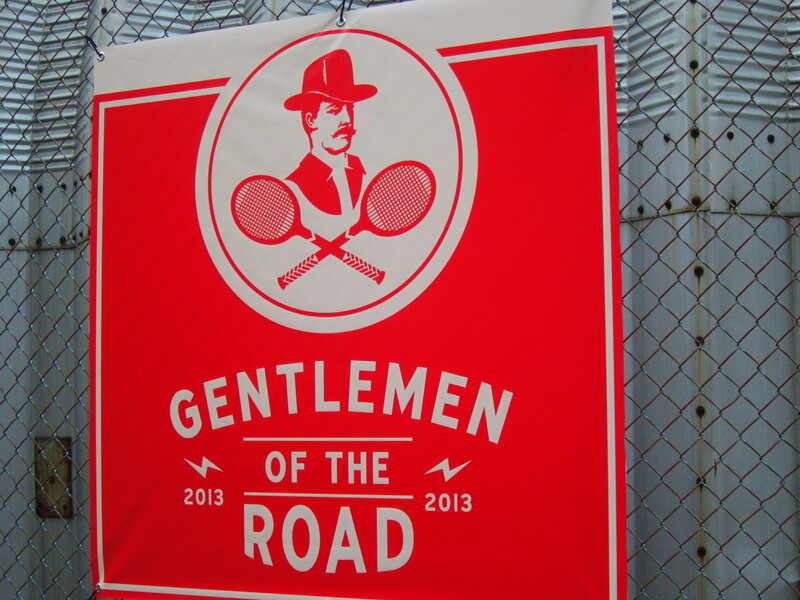 I won’t go into too much detail on Gentlemen of the Road’s history or the show itself, as Cherie already did that, but I will say that all three bands were fantastic and Mumford & Sons completely blew me away live. 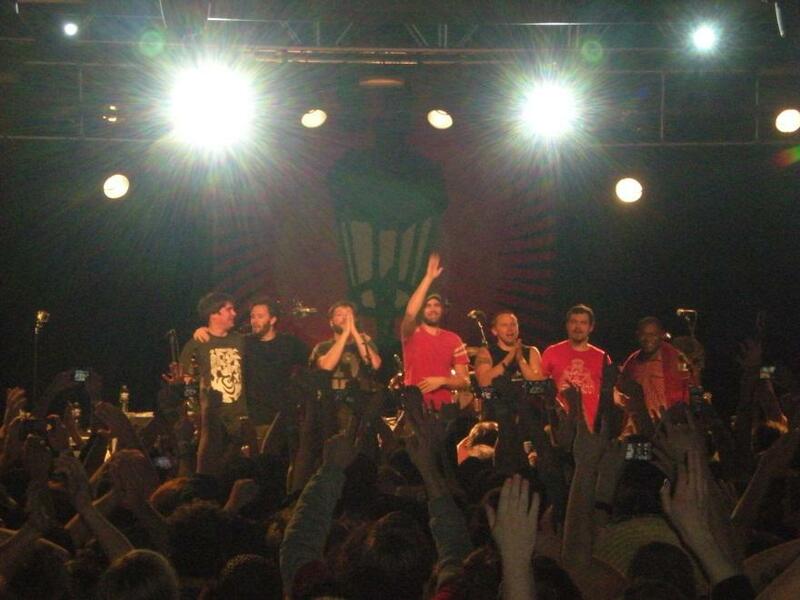 Each band came from England, which made sense as the tour was dubbed the “Full English Tour”. Bear’s Den featured a very mellow acoustic sound akin to Mumford & Sons, banjo and all, while The Vaccines (who I’d gotten to see open for Arctic Monkeys in Central Park) play a faster, garage rock-fueled indie rock similar to Franz Ferdinand, The Strokes, and the aforementioned Arctic Monkeys. 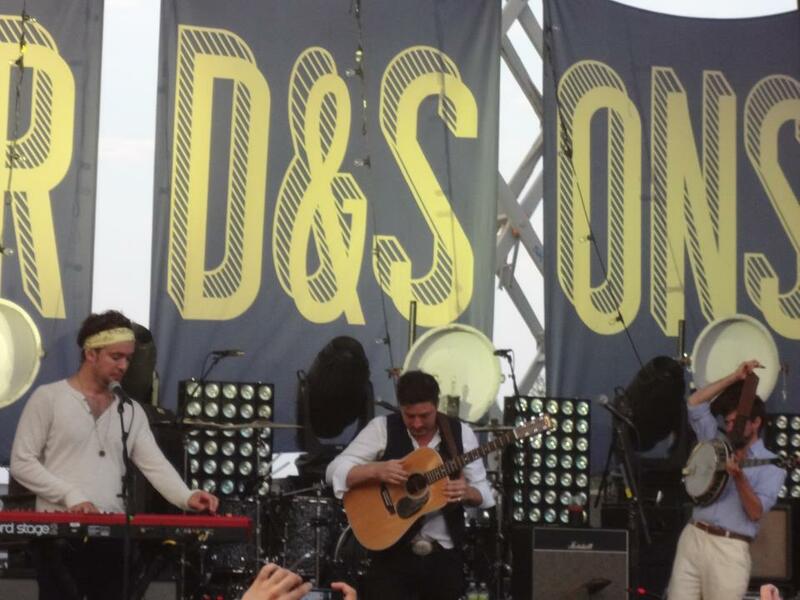 Mumford & Sons tore through a 2-hour long, 19 song set that included 10 songs off their latest hit album Babel and 8 songs off their critically acclaimed debut Sigh No More. Being in the tri-state, they treated fans to a quiet Bruce Springsteen cover during the encore, which brought out chants of “BRUUUUUUUUCE” from the New York crowd, and they ended with their biggest hit “The Cave”, which inspired dancing, clapping, stomping, and singing from the sold-out Queens crowd. 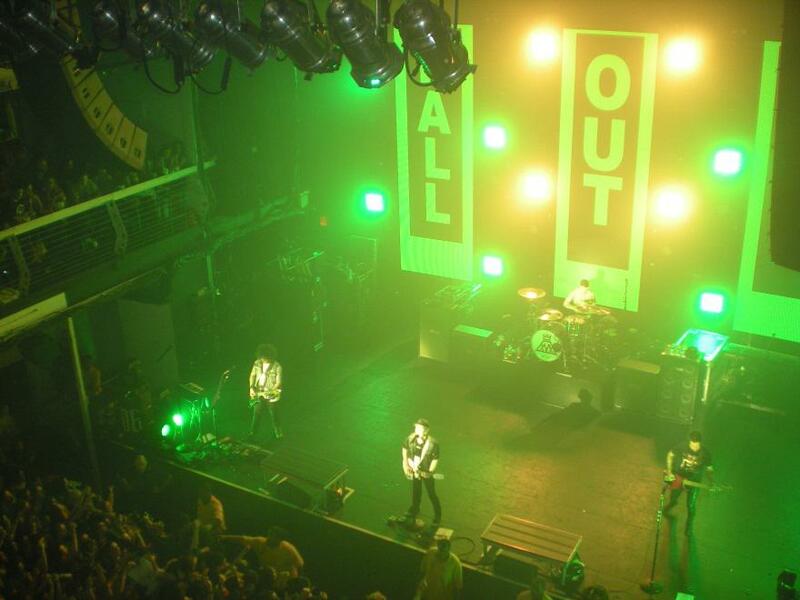 Unfortunately, seeing as how this was the first show in this venue (and area) in over 20 years, inevitable problems arose that will need to be fixed for next summer’s anticipated shows. 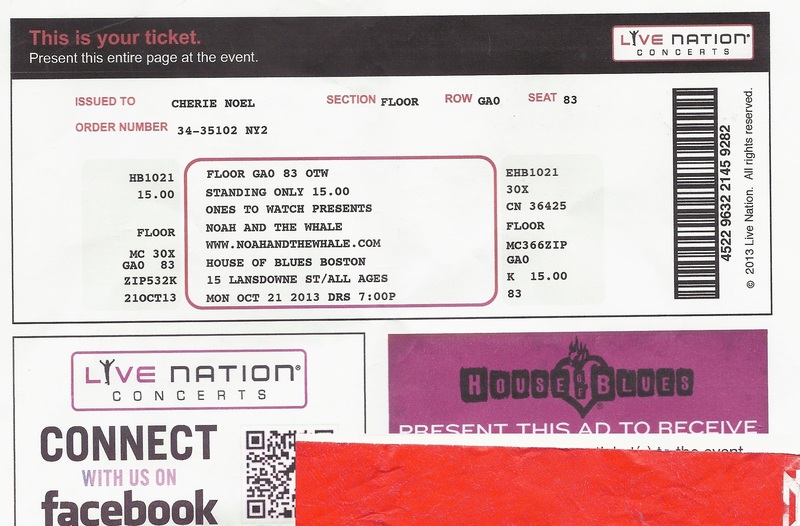 For one, way too many tickets were sold, and some people with tickets weren’t even allowed to enter the venue. Additionally, with only one exit for 17,000 attendees, exiting the stadium was a nightmare and took almost half hour, made worse by very crowded train platforms. Lastly, on top of overcrowding, so many people who attended the show did so because it was the “trendy” or “cool” place to be on a historic night for the community, meaning a lot of the crowd were not real fans. This led to a number of people who came just to drink and talk loudly and take pictures, even while the band was playing, which was beyond annoying. There were many disrespectful people at the show in certain areas and it did take away a little bit from the music itself. Negatives aside, the show was a huge success for Forest Hills. Many businesses were positively affected by the boom in people and traffic and with the potential for future shows at this famous venue, it could be a huge boost for the community. The city added a lot of extra police directing people to the stadium so finding it was no problem at all. The people behind the show admitted to “growing pains” which I think is important because they see the challenges and the problems that need to be fixed and I have full confidence that they will do so to make the next show even better. In the end, Queens New York had the musical moment it’s always deserved. Not content to let their ever growing popularity go to waste, London based quartet Mumford and Sons have started a new tradition. Instead of visiting the same major cities, they’ve made it a point to visit places off the beaten track. 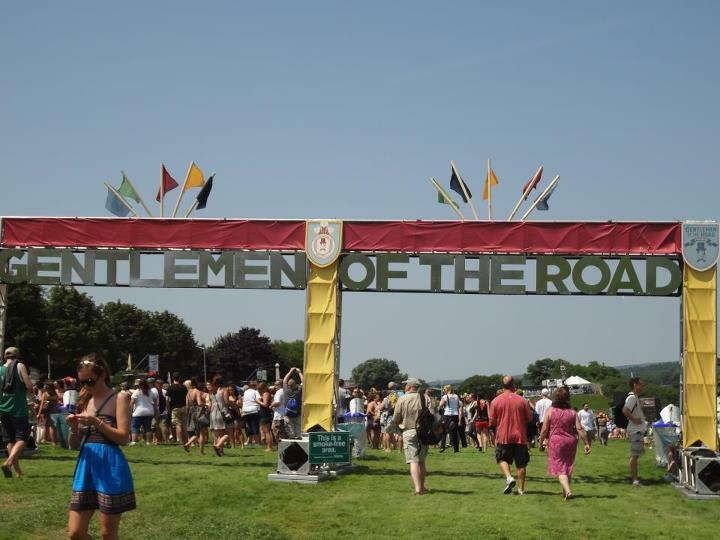 These shows have became known as Gentlemen of the Road Stopover shows (Gentlemen of the Road being a nickname for the band that originated in a documentary distributed with the band’s first album Sigh No More). Last year the band held Stopovers in Huddersfield in England and Galway in Ireland before heading to the US cities of Portland, Bristol, Dixon and Monterrey. A last minute addition took the band to Australia where they played the town of Dungog. 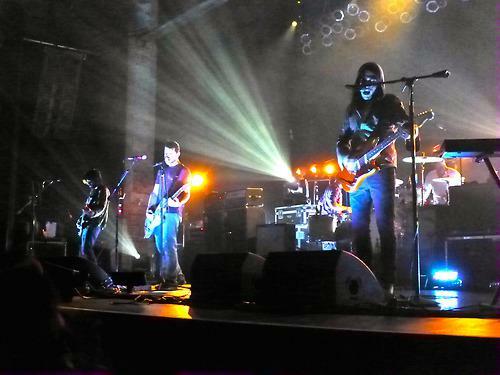 Each Stopover show was a day long music festival, planned and curated by the band themselves. Working closely with local vendors and authorities the band helped promote local businesses and provide a boost to local economies by featuring their goods and services. 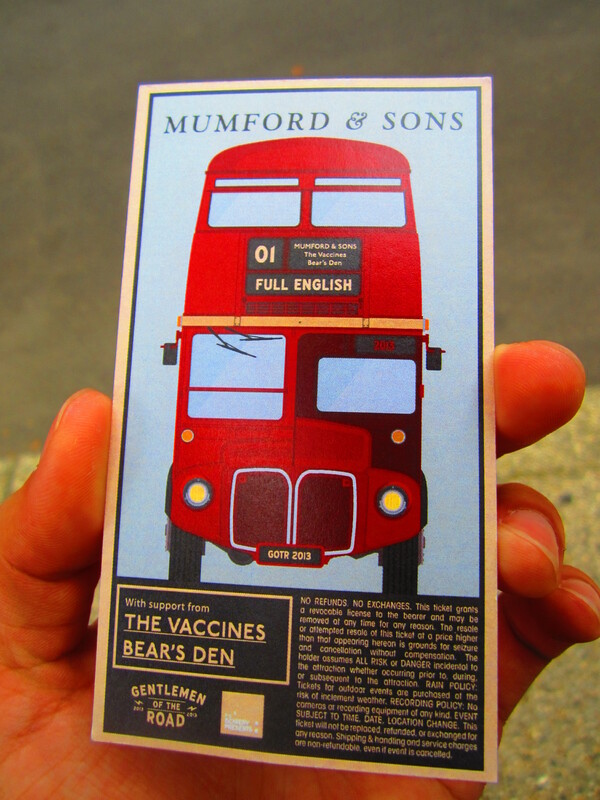 The band also sponsored various after shows around town that concert goers could attend after the end of the festival, some of which were attended by the Mumford lads themselves. 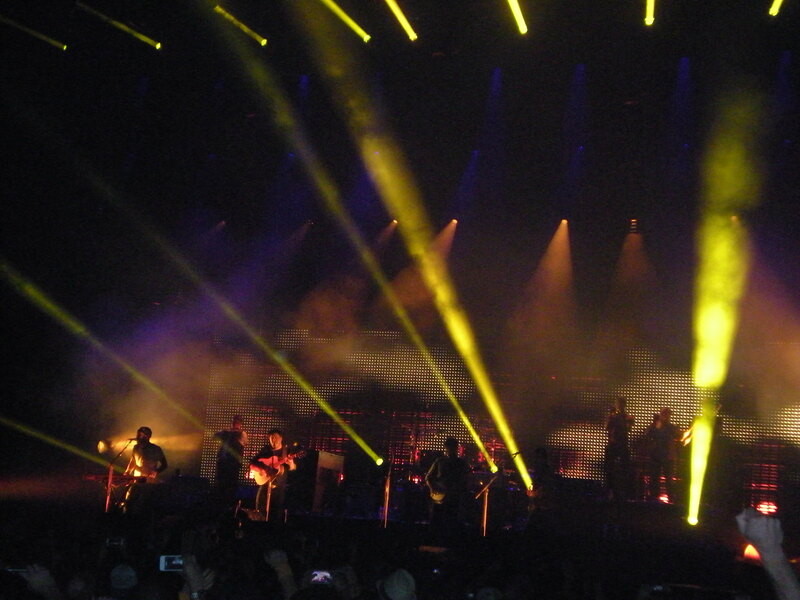 Due to the huge success of the 2012 Stopovers, Mumford and Sons expanded the format in 2013 to a two day event with an even bigger support lineup. They also added more shows between Stopovers. These newly added shows were presented by the Gentlemen of the Road and had the same basic concept as the stopovers but were much smaller in scale. 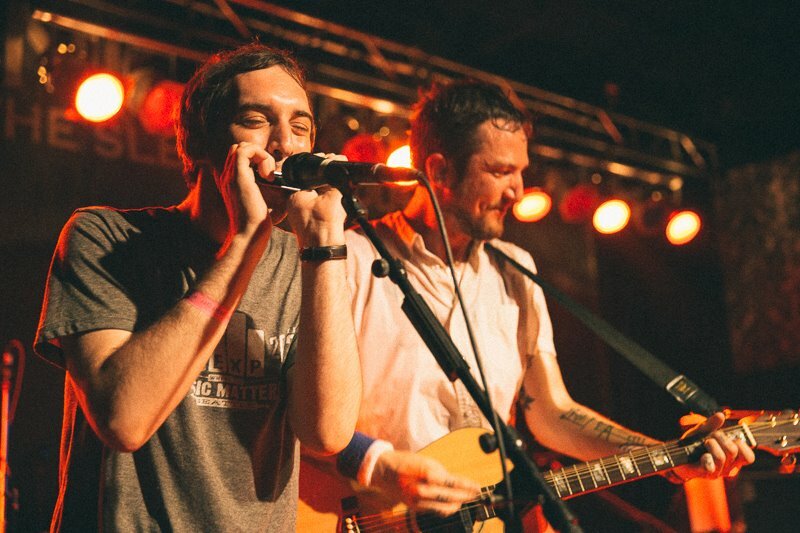 These smaller shows, typically featuring just three bands, were just one day affairs but they still had the local focus of the original Stopovers. 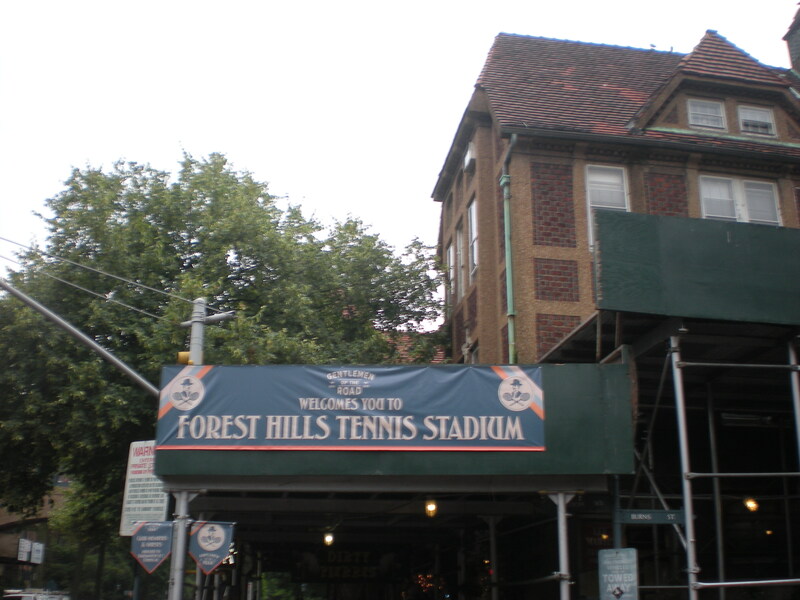 In July Mumford and Sons announced that they would be playing a show in Queens at Forest Hills Stadium, a former tennis venue that also doubled as a concert venue. Past artists to grace the stage included The Beatles, Jimmi Hendrix, The Rolling Stones, and Bob Dylan. The horseshoe shaped stadium, which was built in 1923 to facilitate the crowds attending the US Open, fell into disrepair when the US Open moved to a newer facility in Flushing Meadows in 1978. In order to facilitate the August show, the first in over twenty years, the stadium underwent a major renovation. The Mumford show was meant to be a test run of sorts for the venue, with the intent of adding a few shows a year to the schedule. The show was an instant success, selling out almost as soon as tickets went on sale through an invitation only basis. Three blocks around the venue were shut down to facilitate the influx of people to the venue and there were police and volunteers directing crowds both before and after the show. The only major problem of the show was caused by overcrowding, with some claiming the show was dangerously overcrowded. However, Front Gate Tickets owned up to the problem and offered full refunds to anyone who was unsatisfied with their experience at the show. Growing pains aside, it was a great experience for the community to get behind and benefit from. 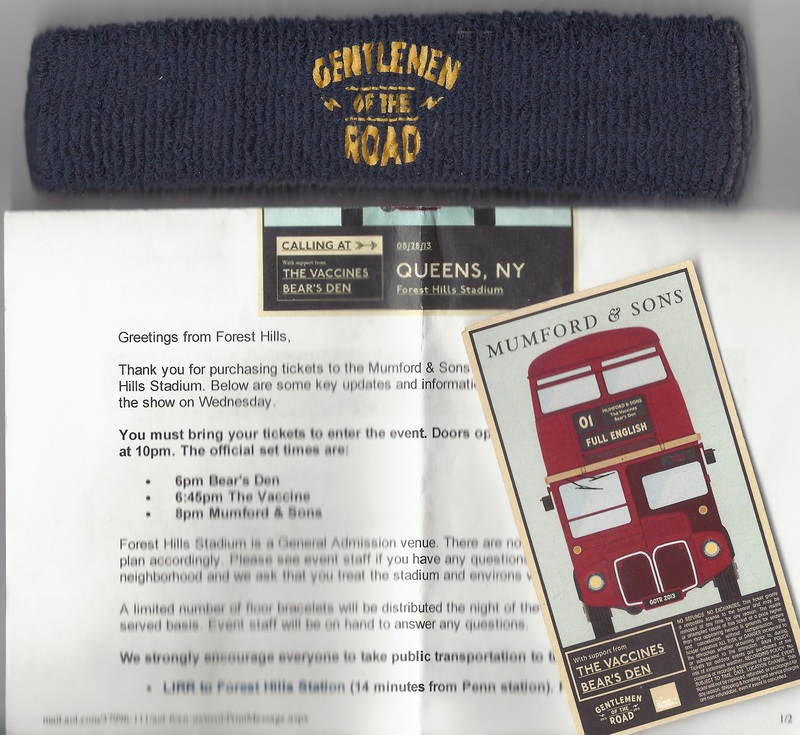 The Forest Hills show is just one more example of Mumford and Sons using their growing popularity to affect positive change in the people and places they come across while touring.